Albert Einstein is famously quoted as saying, "Compound interest is the eighth wonder of the world." And compounding is indeed the topic of this week's shorter than usual letter, but compounding not of interest but of inflation. As you might expect, I am giving a great deal of thought as to how we get out of our current financial dilemma of too much debt and deficits that are far too high. While I will use US data for our illustration, the principles are the same for any country. Let's start with a few graphs from the St. Louis Fed database (a true treasure trove of numbers). First, let's look at nominal GDP over the last 11 years, from the beginning of 2000. The data only goes through the third quarter of last year, so sometime this year it is quite likely that GDP will top $15 trillion. So, the economy has grown by roughly 50%, right? Give or take, that's close to 4% growth (back of the napkin calculation). And in dollar terms that is correct. But what if we took out all the growth that was due to inflation? The economy would only have grown to $12.5 trillion. And in fact, "real" or inflation-adjusted GDP growth was just 1.9% on an annualized basis for the last decade, the lowest growth rate since the '30s. What cost on average $1,000 in 2000 is now $1,250. Now let's run through a few "what-if" scenarios. What if the next 11 years look more or less like the last, with 4% nominal GDP growth? That would mean that in 2022 nominal GDP would be 50% larger than now, right at $22.5 trillion. But that is with only 2% inflation. 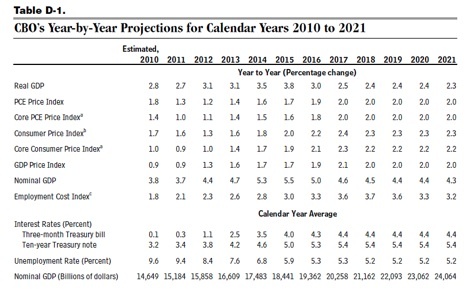 The Congressional Budget Office makes projections, based on various Congressional tax bills, as to what future income and expenses might be. But to do that they have to make assumptions about the growth of the economy and inflation. You can go to their website and see their economic forecasting. The data I will be discussing is on page 7, in http://www.cbo.gov/ftpdocs/120xx/doc12039/EconomicTables%5B1%5D.pdf. 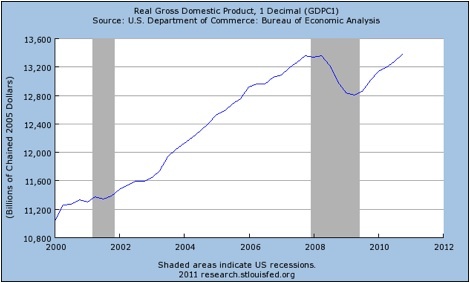 That's a growth in nominal GDP of about 4.5%. Interestingly, they make those upbeat growth projections assuming that ALL the Bush tax cuts go away, but that's a story for another day. They do compare their projections for the next few years with the "Blue Chip" economists, and they are not quite as optimistic as the economists, so this is not outside of mainstream economic thinking. Look at this table. Think about what it might look like with 2-3-4% average inflation and lower growth. What if we don't get robust growth? That means higher unemployment for longer periods. And what if (God forbid!) we had a recession? Let's me see how many in the audience think we can go another ten years without another recession. Especially if we actually do start to cut spending in a manner that might get the deficits under control? I'm not seeing many hands. But it would mean that the debt-to-GDP level might not look as bad, which might just be the plan, in some circles. But not one I want to be included in. Let's think about what less-robust growth, more inflation, or a recession would do to budget projections. These are not nice thoughts for what is in Texas a beautiful spring day. I was asked several times this week if we will see QE3. My answer is, not for some time; but if we had a recession, what would the Fed do? They only have one lever now, as rates are already low. They are likely to print again. Which is inflationary. Which could give us rising inflation with low growth. What's a Fed to do? And as it is beautiful outside and I want to find a place to dine al fresco, I will close here and finish this line of thought next week. But I leave you with this wonderful essay by my friend and fishing partner David Kotok, who ponders the very problems the Fed is faced with, while in Italy for a Global Interdependence Center event. Does the Federal Reserve face its own version of Scylla and Charybdis? We are all thinking about what happens when QE goes away, at least for a while. The Strait of Messina separates the eastern coast of Sicily from the southern tip, or "boot," of Italy. This passage, three kilometers wide at its narrowest, is known for its strong tidal currents. Here is where Greek mythology recounted the tales of Scylla and Charybdis. These two monsters were believed to reside in the Strait of Messina, threatening ships and their crews as they transited through the strait from the Ionian Sea in the Mediterranean to the Tyrrhenian Sea, which lies off the western coast of Italy. The Greeks described Charybdis as a monster who manifested herself as a whirlpool, gulping and spitting out huge amounts of water several times a day, creating the treacherous currents. Scylla was a six-headed and twelve-armed monster, who would consume everything that crossed her path. It was by the presence of these two monsters Greek legend explained the shipwrecks and destruction that took place in these perilous waters. Gazing out at the Strait of Messina from the city of Taormina, I have fulfilled a lifelong dream. I remember, over half a century ago, being struck by the stories of Scylla and Charybdis in the course of studying antiquity and reading Greek mythology. A question within me: What led the Greeks to create these two mythological characters? The answer was clarified by our tour guide. He described how the tidal rise and fall of the Ionian Sea level was substantial. He then explained that the Greeks were completely unaware of how the tides were created. They did not conceive of the power of the moon to pull on water gravitationally. Because they lacked this knowledge, they created mythological explanations for the geographical phenomenon they witnessed. At peak velocity, the currents flow in the Strait of Messina at nine knots. This is a fierce current with which to contend, especially in such a narrow body of water. Such a force would easily overwhelm sailing vessels of the types used in ancient times. It is now understandable how Greek legend brought forth the myths of Scylla and Charybdis. What else could possibly explain the deadly surges ships and their crews had to fight against? Had the sailors known about the tides, would they have operated differently? Would they have timed the tides? How much of history would have changed if the epistemological questions were answered, not with mythological characters but with facts and experience? In addition to touring in Sicily, the GIC meetings in Italy afforded conversations with economists, financial advisors, investors, and colleagues. They lead me to a difficult and intricate question. Does the Federal Reserve face its own version of Scylla and Charybdis? The Fed is completing its program of asset purchases, called by many "QE2." As this program reaches its completion this summer, many participants expect the Fed to call it quits on additional purchases. The current market expectation is that the Fed will then go into a mode of preserving the then-existing size of its balance sheet. As maturities occur or paydowns take place in the mortgage-related portfolio, the Fed will replace those maturities and paydowns with purchases of treasuries. Essentially, the Fed will go into a holding pattern and await "incoming data." Meanwhile, the Federal Deposit Insurance Corporation (FDIC) has just introduced a new factor. We have written about it in the past. Since April 1, the FDIC now costs a bank an additional between and ten and forty-five basis points as a fee on its assets. That is a payment the bank must make - any American bank - to the FDIC. In making monetary policy decisions, the Fed did not have to contend with this cost prior to April 1. Now the FDIC has interfered in a way that adds a cost to the banking system at the very time the Fed is engaged in easing. The mechanics of the FDIC fee act as a form of a tightening. We estimate that the impact is the nearly the same as if the Fed were to have raised interest rates about 15 basis points. By some "guess"timates, the FDIC has taken back all the easing provided by all of QE2. In the last day or two, we have seen the Federal Funds rate trade under ten basis points. Nine basis points is the price of a transaction between two banks, in which one takes excess or additional reserves and sells it to the other. It is also the price at which the government-sponsored enterprises (GSEs), Fannie Mae and Freddie Mac, take their incoming cash flows and sell them to the banking system. GSEs are not permitted to deposit monies with the Federal Reserve, so they have no choice but to sell into the Federal Funds market and get whatever they can, or otherwise earn nothing. Clearly, the selling pressure from the GSEs is driving the Federal Funds rate down. At the same time, the FDIC fee means that it is costing more for banks that would buy the Fed Funds, so we have a double-edged sword at work. Is this interfering with the Fed's monetary policy intentions? Is it setting the Fed or the markets up for a shock when the policy changes? Epistemological questions may be answered with facts, examination, research, and experience. However, the United States has never engaged in monetary policies of the type presently underway. We have no experience to guide us. Has that led us to the error of the Greeks? The alternative to relying on legend would be to see if anything can illuminate our present circumstances. Then we can build models for guidance. Our assertions may be right or wrong. That remains to be seen, but what we do now know is that we have a construction in which the Federal Reserve pays banks 25 basis points for its excess reserves, which are deposited at the Fed. At the same time, the pricing of overnight reserves traded between banks is now down to nine basis points and has been falling erratically. Simultaneously, there is a fee structure that costs banks 10 to 45 basis points, depending on the size and characteristics of the bank, and therefore that pricing is acting as a "wedge" and altering the composition of monetary policy. Think of it in the following way: a basis point on one million dollars is one hundred dollars. As stated before, the overnight interest rate on Federal Funds is nine basis points. Nine basis points are 900 dollars per year on one million dollars of reserves traded between two banks. If you divide 900 dollars by 365 days, you can see that for a smaller bank to do an overnight, million-dollar transaction in Federal Funds is to gain that bank about two and a half dollars. It is simply too much trouble for the bank to go through for such little result. Add three zeros and think in terms of one billion instead of one million. You can see that for a large bank it is still not substantial, and so the intention of Federal Reserve policy making is being altered by this present combination of pricing. We are already seeing banks reorganize themselves to qualify for the lower FDIC fee schedule. What does the pricing indicate? Does it tell us that the value of excess reserves has reached zero? There are indications that affirm this. When you look at the repo market and the pricing of the collateral used in the repo market, you have an indication of how repo is priced. It is currently near zero. One has to ask oneself why this is so. Is there such weak demand as to price the value of overnight liquidity at zero? The alternative question is: has the FDIC effect driven that overnight liquidity pricing to zero? In fact, is there so much excess liquidity that we now face the true confrontation of the "zero bound" in monetary policy? The epistemological question is as classic as Greek mythology: how do we know, and how can we arrive at an answer? The second derivative of that question is what happens when the Fed finally changes this policy. Furthermore, is this FDIC-altered policy the policy that the Fed wants? The home-mortgage interest rate is higher than when the Fed started QE2. The housing market continues to be in doubt and prices in many regions are falling. The economy got an initial burst after the financial crash of Lehman and AIG, but subsequently, economic growth rates are falling. We see revisions of growth rates ratcheting downward. The policy has clearly weakened the US dollar, as allocations of dollars are going elsewhere. What is not clear is whether that reallocation is taking place because of choices made by holders of dollars, like state sovereign oil funds, or being made by investors, or both. Epistemological questions face the Federal Reserve, investors, the US economy, and the world. The true origins of tidal forces were not apparent to the Greeks as they transited the Strait of Messina. They thought they understood; they held strongly to their belief system. The Greeks described their theories through mythological figures, and even deified them. 2500 years later, we understand how some epistemology failings misled the Greeks. As for the US and its policy at the Federal Reserve, we are operating on legend and uncertainty. As investors, we confront the likelihood that the short-term interest rate will remain near zero for the rest of this year. The gulping and spitting of excess reserves is coming from the modern Charybdis. The FDIC fee is the modern-day Scylla. Investors will face the "zero bound" in interest rates for a while longer. They can sit on their cash and earn nothing. They can fret and wring their hands about a ramp-up in inflation, but the evidence so far does not support it. They can stay in the US dollar, in which case they can watch their dollars weaken relative to the rest of the world. Travelling in Sicily or Rome validates how strong the euro is relative to the dollar. All you have to do is buy a dinner or hotel room. We are back in our office. It has been an enlightening trip. We have been able to examine some history while discussing monetary policy and financial affairs. This writer, finally, and after nearly 60 years, was able to witness Scylla, Charybdis, and the Strait of Messina. Lastly, we return during the Christian Holy Week and during the Jewish Passover festival. We celebrate faith and freedom. We do not actually burn a sacrificial animal. We invoke it as a symbol of the past. This year we do so after being reminded that those ruins of temples and amphitheaters, those paths and stone quarries, are evidence of slavery. The Trojan, Carthaginian, Greek, Roman, Arab, Norman, Spanish, and other conquerors of Sicily all used slaves. To a human being, legend and deification can be a dangerous thing. Freedom is as fragile as a weakened monetary and political system will make it. Modern mythology resides in the temples in Washington, not in the Messina. This Thursday I head for La Jolla to be with my partners at Altegris Investments for our 8th annual Strategic Investment Conference. So many old and new friends will be there, as it is again sold out. It is something I really look forward to. Then Sunday I fly to Toronto, where I will be with host Adam Felesky of Horizon Exchange Traded Funds and speak at noon on Monday. I will be in Cleveland on Wednesday, speaking in Elyria in the evening. Let me commend to you a new book by my great friend Bill Bonner, of Daily Reckoning fame. It is called Dice Have No Memory. It is a collection of the best of his essays. I once said that when I read Bill I feel like a house painter standing before a Rembrandt. He is one of the really great writers I know, and can tell a tale with a point like few other writers. He is just so gifted. You can read him in short pleasurable bursts in the evening, or of an afternoon with a nice glass of wine. "Dear John, why didn't I read that email? It would've saved me some grief (assuming I would've then paid attention to it). Should I read your latest book that came out? Or will I wake up in the middle of the night screaming?" Have a great week and a wonderful Easter weekend. I see family and fun in my future. It's good to see your starting to recognise aspects and consquences of the inflation mega-trend, especially as you have been mistakenly banging the deflation drum for several years until quite recently.